No, “plopping” is probably not the best thing since yoga pants. But for many girls with curly hair it’s a close second since it’s said to be a foolproof way to get amazingly well defined curls without a lot of fuss and bother. So if that frizzy mess you casually refer to as “my hair” has been driving you bonkers for longer than you can remember and a buzz cut is starting to sound good step away from the clippers! You never know. This may just the hair-saving technique you’ve been looking for but couldn’t find. Question: What Is Plopping Exactly? It’s a heat free technique usually using a t-shirt to tame unruly curls that produces polished, bouncy spirals that best of all are frizz- free. Or what those with curly hair would call a dream come true! Question: How Does One Plop? There’s really not a lot to it. In way of prep some will suggest sopping up the excess water from you hair by scrunching for a minute or two first with a micro fiber towel. And if your strands benefit from styling products you are going to want to apply them now before letting the plopping begin. Those details out of the way here’s a quick three step play by play. Step 1) Spread your large t-shirt on a flat surface be it a countertop, the toilet with the seat down or your bed. Most prefer to have the neck of the shirt pointing towards them. Just be sure to have a large enough shirt to do the job. Meaning more hair calls for a bigger shirt. Step 2) With your curls on the top of your head (some will gather their strands into a high pony) bend over and let them pile up onto the shirt until the crown or your head just kisses it. Step 3) Gather the hair up in the shirt using the sleeves to tie things neatly into place. Now if that’s clear as mud and you’d prefer to watch someone do it never fear. Here’s two short video clips that show you how. The purpose of including this video is to show you what’s involved and why a long sleeve T-Shirt may work best for you. That could be important if you’ve never plopped before or if you’ve never used a long sleeve t-shirt before. Okay but as they say if one demo video is good two must be better. This second one demonstrates a slightly different approach using a short sleeve shirt. Sure it ain’t pretty but it sure is effective at producing nicely defined curls. And much more fun than accidentally rubbing hot sauce in your eye. So there you have it – plopping hair in about 2 minutes or less. Twice. Question: Yeah But, How Does This Work? This is almost the best part. When you place all your hair on top of your head and wrap it up in the t-shirt, the defined curls almost happen by magic. That’s right. Or as Allure magazine put it you might look at it as if the curls when all pressed together like an accordion in the T-shirt almost scrunch themselves. Even better your hair dries way faster than it ever would by air drying alone. Which I guess is why it’s said to be the easiest way to dry curly hair. But you get another big benefit here. It’s a totally hands off technique. 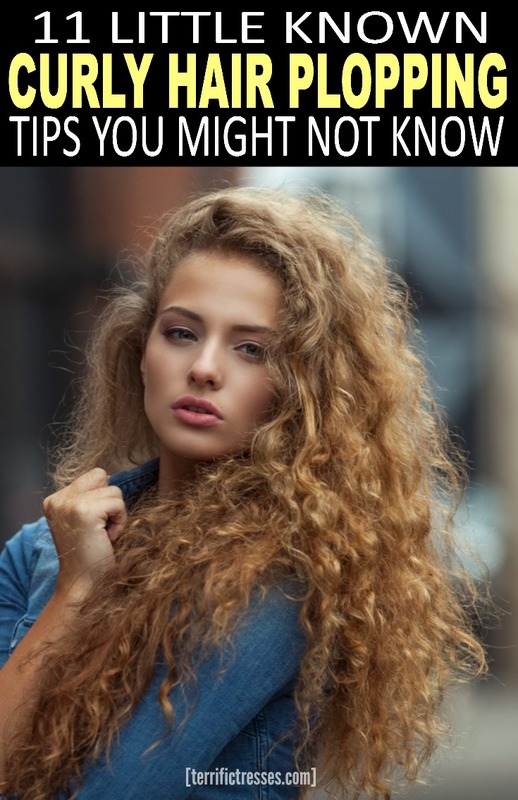 And anyone with curls knows the more you fuss with your hair as it is drying, the more you touch it period – even when styling, the greater the risk of ending up more frizz than you want. With plopping you avoid that completely. Question: Why Does This Work So Well For Some? It’s friction-less! Let me explain. Sure you could, and probably have, wrapped your hair in an ordinary towel. But here’s why you probably don’t want to do that. Drying curly hair with a terry cloth towel only riles things up which is the kiss of death since all that friction means tons more frizz and crazy wild hair. In comparison wrapping your hair in an old t-shirt avoids all that. Being much more absorbent and thinner, the t-shirt wicks the water away from your hair so it dries much faster. Not to mention drying this way doesn’t disturb the curl pattern. Plus gravity is not pulling the curls down either. Question: What Does Plopping Do For Your Hair Exactly? You may find the technique does a couple of things for your strands. For one it will produce loads of nicely defined curls with better definition than you can get any other way. And two, if you use leave in conditioner, the T-shirt will trap the heat coming off your head helping the product to better penetrate your strands. Leaving you with super soft luxurious tresses. Three, it frees up time to do something else other than work on your hair. Good question. There are no hard and fast duration rules here. You basically want to leave the t-shirt on for as long as it takes to do the job. And there are two ways to approach this. For some that’s 20-30 minutes is long enough for their hair to dry sufficiently. From there they may let things air dry or they may spend a few with their strands on the diffuser before heading out the door. Others sleep on it. Finding that after 7 or 8 hours their hair has dried completely and with the great unwrapping in the morning all sorts of fabulous curls fall out. Question: Do I Have to Use Products? I get your point. There’s always products involved because it wouldn’t be a hair tutorial without them, right? Well, the nice thing about this one is products are optional. Basically if you use products in your curly hair routine now you can continue to do so. If you don’t you can continue not using them. In other words the success of plopping isn’t product dependent and it’s hard not to like that. Of course the list of products most often used would include the usual suspects – leave in conditioner, smoothing serum, and styling mousse or gel. The idea is to control frizz and flyaways while adding softness to those curly strands. Oh and just like you would otherwise do you’d likely avoid applying anything moisturizing much above the ears since the natural oils coming off your scalp would take care of that part of your hair. And you may want to comb through your just washed hair to make sure they are distributed evenly. Question: What Else Should I Know? Ideally those with medium length or longer tresses will have the best chance of success with plopping. Or to put it another way this fuss free technique may not work best for those with coils that fall above the shoulders or shorter. Because rather than unveiling the best curls of your life when the t-shirt is removed, the hair may stay “up” which is commonly known as clown hair. Or the curls may be misshapen or, frankly, oddly squished. Or blessed with flat spots galore. That’s certainly not the look you’re going for I’d imagine. Okay so now for the tips portion of our presentation. Or as we like to call it, tips, tips and more tips. Pay attention here. There is likely stuff you don’t know in these 11 gems. The trick with this technique, if there is one, is to use the thinnest t-shirt you can get your hands on. The fact it is so thin will allow the water to wick away and evaporate faster. Keeping in mind the role of the t-shirt in this hair care drama isn’t to act like a towel. It’s more to simply hold your hair in place. So if you’re hair isn’t drying overnight, try this move. Another suggestion if you do this overnight and your hair isn’t dry in the morning is to try scrunch it damp first, or let it air dry for a bit, then plop and then go to sleep. Also if you’re trying to “sleep on it” and the t-shirt keeps coming off due to all your tossing and turning try going with a t-shirt with long sleeves. Those longer sleeves will help you to get a better grip when tying things up. But still remember that the idea here is to cinch up the t-shirt so it stays securely in place not do its best tourniquet imitation. Any t-shirt is generally nice and smooth so it doesn’t ruffle the cuticles while your hair is drying all coiled up. Avoid ending up with hair that is more smashed than smashing by loosely piling your hair on the top of your hair inside the shirt. You want to deliberately and slowly stack your curls on top of each other to avoid entanglement. Don’t even think of using some generic dollar store terrycloth towel for plopping or scrunching. They feel anything but smooth. So all those tiny little threads on such towels will do nothing but rough up the strands of your hair which is a sure fire recipe for frizz. If you need cheap micro-fiber towels for scrunching raid the garage looking for cleaning cloths. If that fails head for the car care section of any Target, Home Depot or nearby auto parts outlet. You can often find 16 inch by 16 inch or so hand towel sized cleaning cloths going for less than a dollar each. Perfect. Experiencing a few flat spots? Nothing to get excited about. Just give them some extra styling love using your curling iron to quickly touch them up. Beats having to style all your hair, don’t you think? Unfortunately this is NOT a way to make straight hair curly (there are other ways to accomplish that). It is a way to give your naturally curly strands a chance to dry without frizzing up. Also always remember one simple rule – hands off. That’s right. The less you mess with it the better it will turn out. So do not play with the curls, or any curls for that matter, when they’re even the slightest bit damp. Resisting that impulse will maintain the definition and avoid frizzing up. Even when you are adding product see if you can get by with just barely scrunching very gently – disturbing your curls as little as possible. Along the same lines it is better to emulsify your products first by rubbing your palms together so you can use a light touch on your tresses to distribute them as evenly as you can. Hope you can see why some say plopping is the anti-blow dryer styling method. Besides few things are as liberating as not having to spend all that time drying, straightening or styling those curls after shampooing. If you can get past the rather lame term this goes by plopping is a life changing way to dry your curly hair. One that produces nicely defined waves or curls that cascade perfectly just like in the shampoo ads. If you liked this you will definitely want to check out our curls gone wild board on Pinterest. Yeah why not grab some curly hair inspro and while you’re at it can you please follow us? That way you won’t miss out on any of the “finds” we post to that board?